A Jasper man is looking to capture the Republican nomination for a spot on the Jasper Common Council, representing District 3. 44-year old Chad Lueken officially filed his paperwork with the Dubois County County Clerk on Monday. 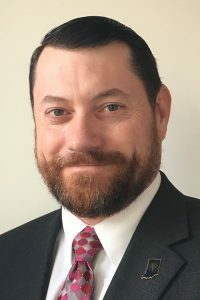 Lueken earned a bachelor’s degree in History from St. Meinrad College in 1997, and has been an insurance agent with Knights of Columbus insurance in Jasper since 1999. Chad believes his experience working with individuals and families over the years will transfer well to government. He says his business is about relationships and says representative government should also always be about relationships-not with special interests, but with the people they represent. Lueken enjoys helping clients with problem-solving and implementing financial strategies for winning. He says he hopes he can do the same for the city of Jasper. He says the city council must identify the highest and best use of every tax dollar, improve efficiency, and increase transparency. Lueken says the big issues for the city in the next several years are: funding the Midstate Corridor and monitoring closely the success or failure of the city’s TIF district. Lueken is a proud veteran of the Indiana Army National Guard. He is an active member of the Jasper Knights of Columbus, a registered leader with Boy Scouts of America, an adult volunteer for St. John Bosco Youth Ministry. Chad and his wife of 20 years, Yvonne, have 9 children and have been involved with Christ Renews His Parish at St. Joseph Catholic Church, as well as the RCIA program in the parish. The Luekens are proud members of Dubois County Right to Life. Be the first to comment on "Lueken Files For Seat On Jasper Council"